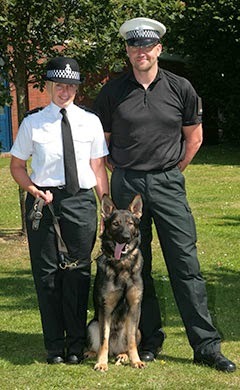 As previously reported PC Phil Wilson and Police dog Jack and PC Simon Willan and Police dog Charlie have already successfully passed their operational assessments and are now serving as operational Police dog teams in Exeter and North Devon respectively. So the last few weeks have been devoted to preparing the 2 remaining dogs teams PC Mark Stevens and Police dog Axel and PC Carla Lamble and Police dog Arry for their operational assessments. 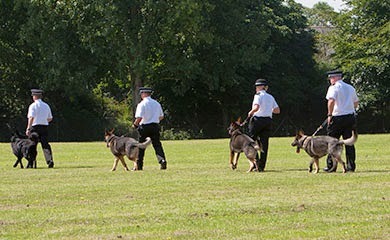 Here are a few pictures of Axel and Arry undergoing training for their licensing assessments. 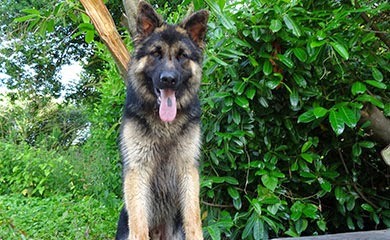 Axel staying in the down position after being left by his handler Mark. This is a very important exercise for a Police dog who must stay put until his handler releases him from that position. 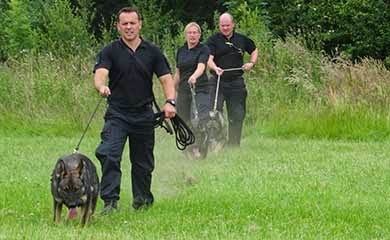 It allows the handler to carry our other functions like searching a suspect or going over to talk to a witness. 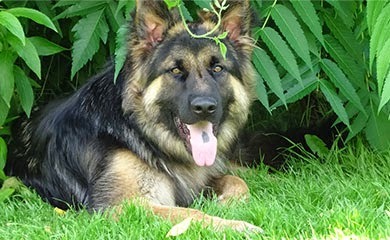 The dog should only move if the handler releases him or his handler gets attacked. Mark returning to Axel after 5 minutes and is about to reward him. 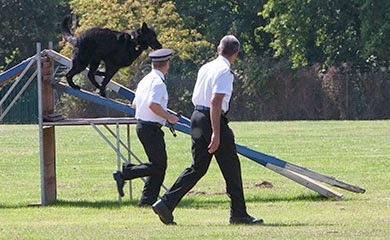 The above shows the same exercise being performed by Police dog Arry. 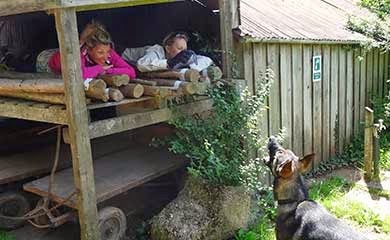 The above shows Police dog Axel barking at 2 likely suspects he has found hiding amongst a wood pile to alert his handler he has found them. The above shows Arry relaxing with one of volunteer helpers Clare who was acting as a missing person for the day. 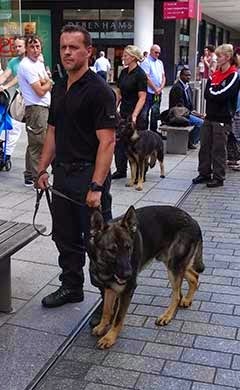 The above shows Axel and Arry continuing with socialisation in Exeter city centre so important for a Police dog to be reliable and sociable around members of the public. Thursday 17th July assessment day arrives but unfortunately Axel has bruised his leg and cannot be assessed for several weeks as he needs to be rested. 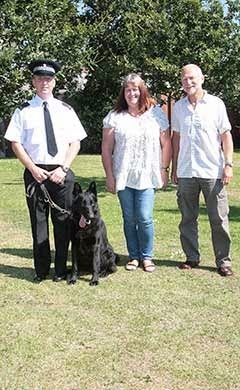 Arry successfully passes his assessment despite a very hot day and is now a fully licensed Police dog. 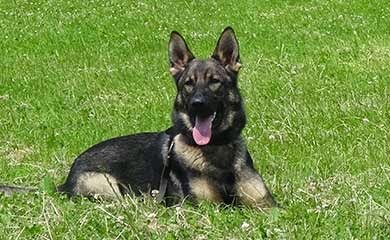 Although Axel still has to pass his licensing assessment we are confident he will do so in the next couple of weeks and so rather than postpone the passing out ceremony we go ahead. 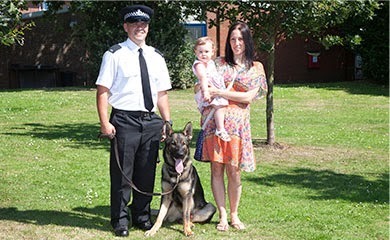 The passing out display takes place at the end of all of our initial Police dog courses because it gives the handlers an opportunity to share their graduation with their families and their puppy walkers who have made a big sacrifice looking after the dog for nearly 12 months before handing him/her over to the handler. The passing out display took place at Police Headquarters in extremely hot conditions. 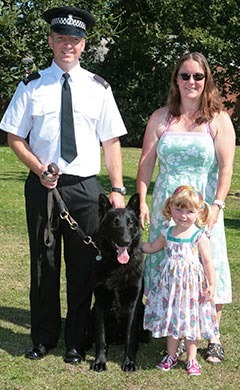 We started with photo’s where the handlers were able to have official photo’s taken with their families and puppy walkers. 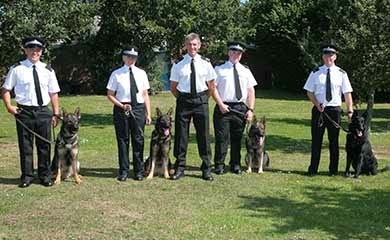 After the photo’s the dog teams put on a display of agility, obedience and criminal work. 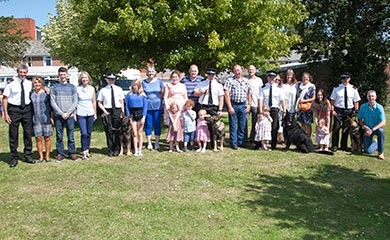 After the display Chief Inspector Evans the officer in charge of dogs presented certificates to the handlers and a framed photograph of each dog was presented to the puppy walkers. A buffet followed and everyone went home having had a great day. Here is a selection of photo’s of the day. 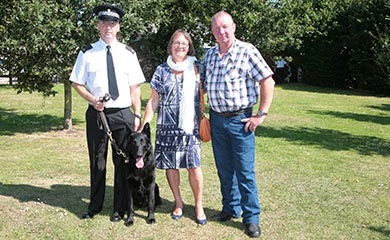 The above shows Jack with his first puppy walkers Lyn and John. 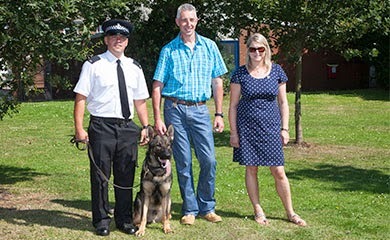 The above shows Jack with his second puppy walkers Angie and Graham. The above shows Jack with his family. 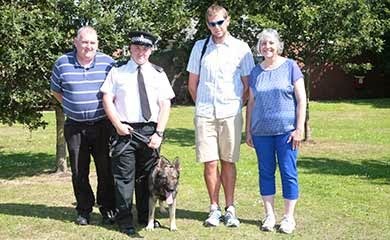 The above shows Charlie with his puppy walkers Mike, Steve and Diane. The above shows Charlie with his family. 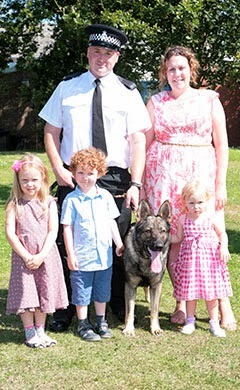 The above shows Arry with his puppy walkers Paul, Ella, Tracey and Josh. The above shows Arry with Carla and partner Ian. The above shows Me and my wife Diane and all the dogs with their puppy walkers and families. 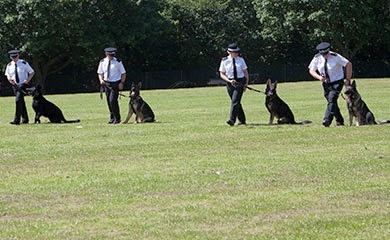 The above two image shows the dog teams doing their group obedience. The above shows Jack doing the agility section. 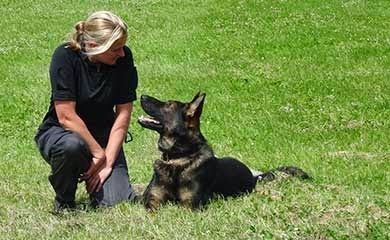 The above shows Andrea Ormsby the BBC Spotlight reporter relaxing with Axel and Arry the first Operational Police dog bred by the force. Well there you have it a lovely day to round off the end of our January 2014 course and now its time to select which dogs are going to be on our September 2014 course. See you next time when I will let you know which dogs will be on our next initial Police dog course and one dog will be going to Dorset Police dog section for their initial Police dog course. 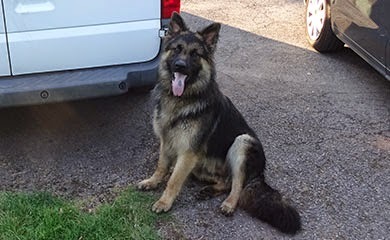 Yogi is now 9 months old and as his puppy walkers Terry and Jill Hodge are visiting their relatives in New Zealand I agreed to have him for the 6 weeks they are away. I am 3 weeks in and thoroughly enjoying having him. He is everything anyone could want in a Working German shepherd. He is outgoing, enjoys meeting people, social, willing, intelligent, very enthusiastic, responsive, and is non dog aggressive. Yogi Joining me on the swing seat. 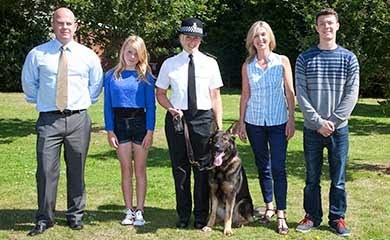 Will he make a Police dog? I have no doubt some forces would prefer him to be a little bolder. For me he is everything I could wish for at this age. He will get much stronger and harder as he matures and I have no doubt by the time he is 3 years of age he will still be a sensible and honest dog who will always retain that goodness and trustworthy character that he was born with. The breeder Dave Fermor in Dover should be congratulated on producing a dog with such good character and his puppy walkers for providing a loving home and excellent socialisation so vital to a puppy’s development. For those of you who have not read my previous blogs I purchased Yogi from Dave as a potential future stud dog and Police dog to provide an independent lineage to the pups we have bred in the A and B litter. 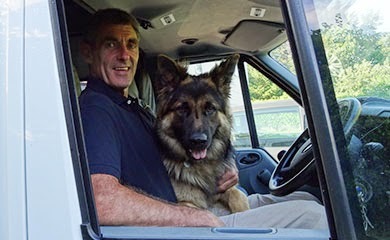 I have spent most of my Police service working and training with Police dogs and I have seen many examples on my travels of Police dogs with very poor character. 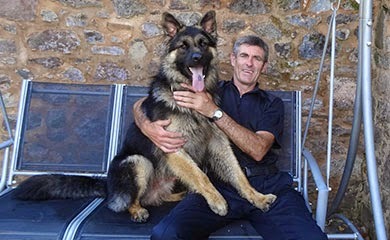 The priority in selecting a Police dog has to be good character because a dog with good character who has been well socialised and has been provided with leadership is able to cope with stressful situations and is able to differentiate between normal situations like walking through shoppers in the city centre or interacting with children in a school and dealing with non normal situations like violent criminals or rowdy crowds. 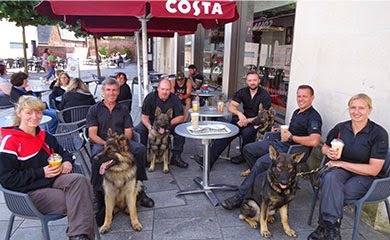 Yogi hanging out with the big boys Arry, Axel and Charlie at Costa coffee in Exeter city centre. Note how relaxed the dogs are together and comfortable with crowds and people approaching them. That is why our puppy scheme is so important. We select our pups from parents of good character and we watch their characters develop as they grow into adults. Our puppy walkers work hard on their socialisation and attend fortnightly development sessions. Once they have received their early socialisation they are taught to ignore other dogs, to walk sensibly through livestock, to accept approaches from all types of people. They are taught good manners and learn to accept leadership and boundaries. They grow up as part of the family. 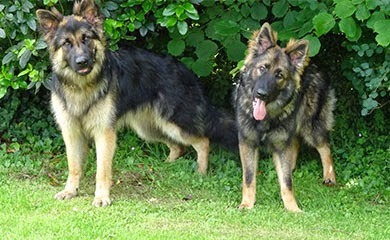 Their socialisation should continue throughout the Police dogs life to keep them stable and well balanced. 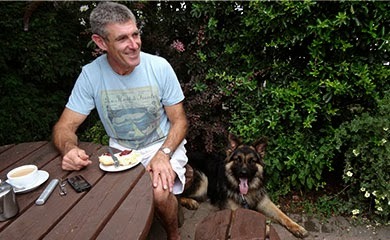 A well balanced dog with good character who has had the time invested in socialisation, development, and training is a joy to own and is pleasure to take out and about. 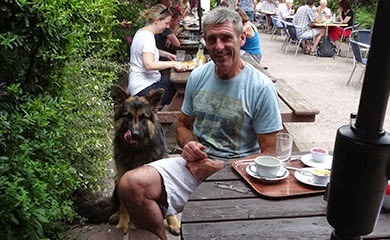 The above pictures, taken by my wife Diane, show Yogi and I enjoying a cream tea in a busy cafe without any begging or trying to get to other dogs passing through. A dog who is well behaved and responsive in day to day circumstances is much more likely to be well behaved and responsive in work situations where control is such a vitally important part of being a Police dog. 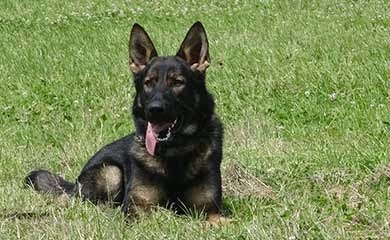 Such a dog is also much more likely to remain clear headed and understand exactly what is required in high pressure situations and therefore is much less likely to be a liability by biting innocent members of the public or Police officers he/she is supposed to be working alongside. Yogi waiting patiently for me by the van as he does every morning when I let him out keen to go off on our next adventure. Shows Yogi attacking the garden hose while I try unsuccessfully to fill the water trays for the birds. 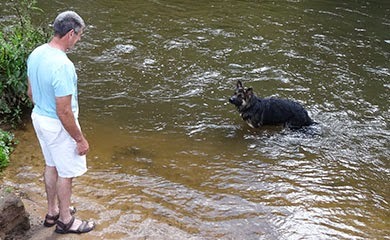 I will end with some pictures of Yogi enjoying the river Otter with me after our cream tea. He played happily with other dogs he met and was the perfect gentleman walking past other dogs on the way back to the car. A lot of work is required to get a dog to learn what is required of him/her and to behave in a sensible and well mannered way. Is it worth all the hard work. I will leave you to decide. You know what I think. See you next time when I will report on the passing out ceremony for Arry, Axel, Charlie and Jack.